One of my fondest college experiences was taking a course covering the history of jazz and its impact on American and World music. Other than my courses in writing and film, that one course, filled with history and music made the greatest impression on my young life. It turned me on to Miles Davis, Coltrane, Thelonious Monk and Charles Mingus and opened up a window to a world of sound that says more without lyrics than many songs with vocals ever could. So, excuse the brief nostalgia as I try to seamlessly segue into noting who may be the best, new, local (for the Denverites) jazz fusion group in years. 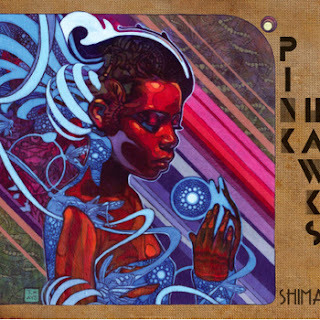 Pink Hawks, who will release their album Shima officially on May 13th with a release party at The Mercury Cafe, bring charged political awareness and energetic, spirited sounds to an oft forgotten genre. With Shima, the combination of expert musicianship and potent, if occasionally "on the nose" lyrics, Pink Hawks create an undeniable sound. To call this new jazz is a compliment, but also an understatement. Shima, with its four tracks spanning 41+ minutes, lives on a powerful mix of growing horns, wailing vocals, dancing keys and rapturous guitar riffs. And though their site tags them as afrobeat and world music, they are so much more than that. The opening track on Shima, "Everything Is Poetry," is nothing short of perfection. It opens quietly with tapping percussion that precedes a sturdy bass line. Horns hop in offering bits of the melody that add up with each measure until we finally hear the full picture. And once we do, it's a song loaded with all the energy and spirit of anything written by the greats of the Big Band or Combo eras. If you've ever heard Mingus' "Original Faubus Fables" you will feel the connections here, even as the electric guitar and contemporary production elevates the sound, the overall tone and design is the same. Pink Hawks are blatantly political and philosophical, using elegant jazz to tear down societal notions with incredible momentum. There are points, where the lyrics are too blatant, as I noted earlier, but those moments of aggressive protest are so perfectly matched by the energy and experimentation of the music that any minor trespasses are ignorable, and in many cases welcome. "Separate the Corporation and State" is a perfect example. The vocals are a mantra, chanting that idea. It's heavily political, pounding the message repeatedly, while offering pristine sonic backing. Again, I think of Mingus here, as call-and-response rule the track. The sultry tango-esque "Misery In Threes" may be the crowning achievement of the album, though. It takes slow steps, horns and woodwinds warbling over marching drums. It's a sad, meandering song as implied by its title but a beautiful key solo at the 3/4 really adds fragility to the track, accentuating the tenuousness of any sexuality that comes from the horns and drums. Life is often beautiful and sad, and that's something this song demonstrates exceptionally. The fourth and final track on the album "Addicted to Pain" starts with tapping drums and a phenomenal bass line, guitar pops in, dancing around in the open spaces perfectly and then comes the sax. This is another politically charged track with a batch of more stream-of-consciousness lyrics, rollicking and passionate. It's a perfect closer to an excellent album. So, as the question may come up, perhaps, where one might find great new jazz that isn't "smooth" (which is almost always a radio code-word for sleepy and boring) I fully recommend pointing any who ask to Pink Hawks. Shima is brilliantly produced, intricately orchestrated and charming in every way. It will get your feet moving as much as your heart. And it's a great complement to coffee, smoky bar spaces (though they no longer exist) and political-noir mentality. You can find Pink Hawks and download the album on their site here and if nothing else, take the time to stream it. You'll be glad you did.